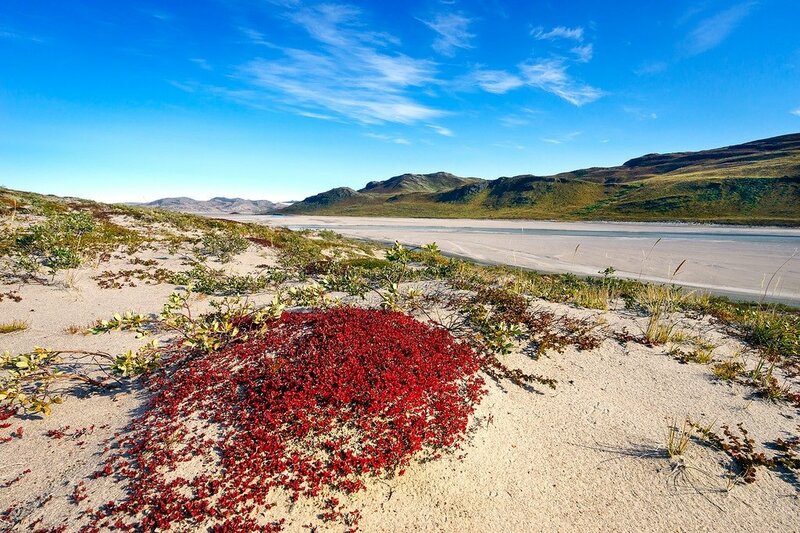 While 85% of Greenland is covered in ice, there’s a narrow strip along the coastline that’s actually green! And red. And purple. And yellow. In fact I would soon learn that Greenland can be pretty colorful. It’s also the most sparsely populated country on the planet. To give you an idea of just how sparse, Greenland has more landmass than Mexico, yet has a population of only 50,000 compared to Mexico’s 122 million. There’s a lot of untouched wilderness to explore here. 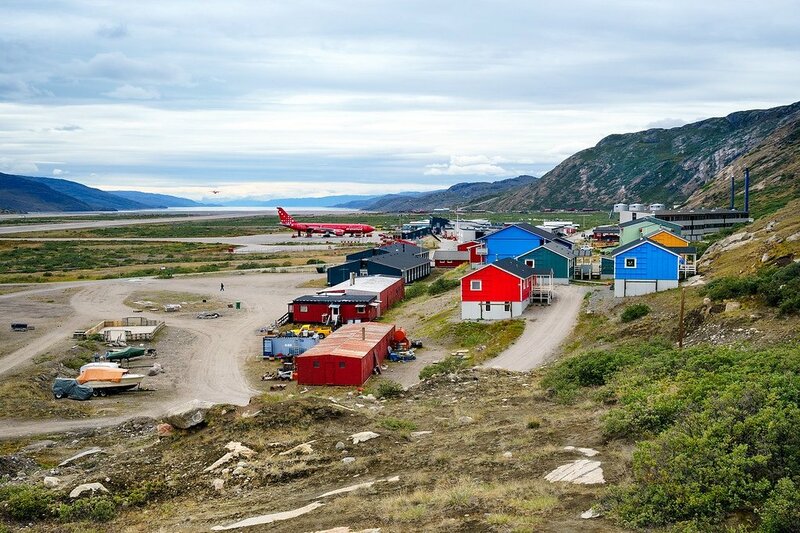 The small town of Kangerlussuaq (population 500) is home to Greenland’s largest international airport. I began my adventure here after a 4 hour flight from Copenhagen, Denmark. 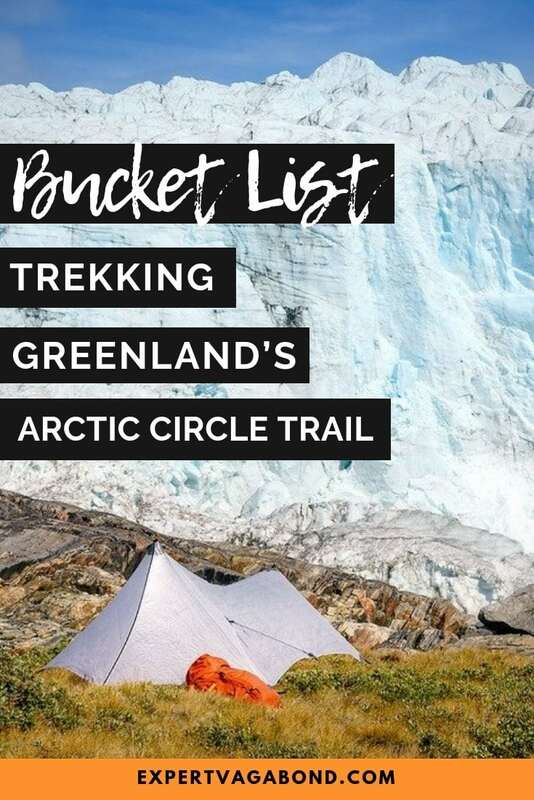 Greenland’s Arctic Circle Trail is often listed as one of the best long-distance hikes in the world. 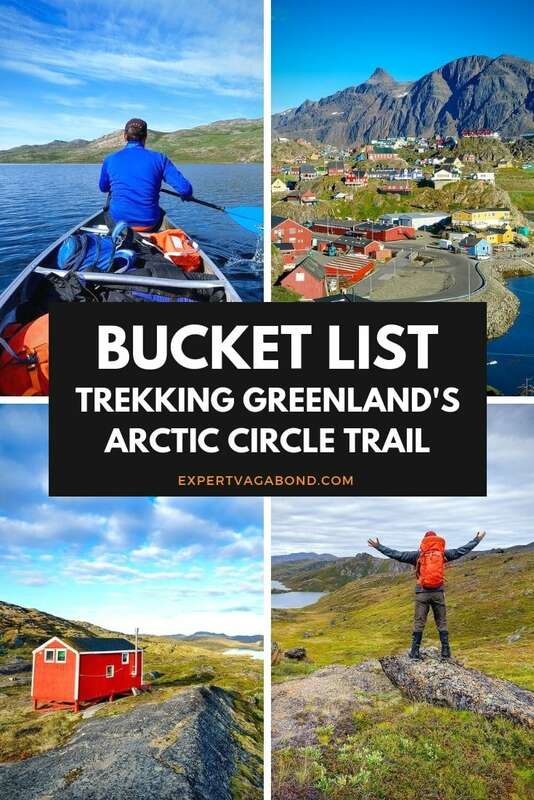 The trail stretches up to 200 kilometers (124 miles) from the edge of the ice cap to the fishing town of Sisimiut on the West coast. Depending on fitness levels and the specific route chosen, it can take anywhere between 7-12 days to complete. Spread along the trail are a couple of basic wooden huts for bad weather, but packing a tent is recommended. Only 300 people hike the trail every year, so while you may run into other hikers, it’s possible to go days without seeing a fellow human. The normal hiking season is from June to August. I was hiking mid August to avoid swarms of mosquitos that plague the area earlier in the summer. 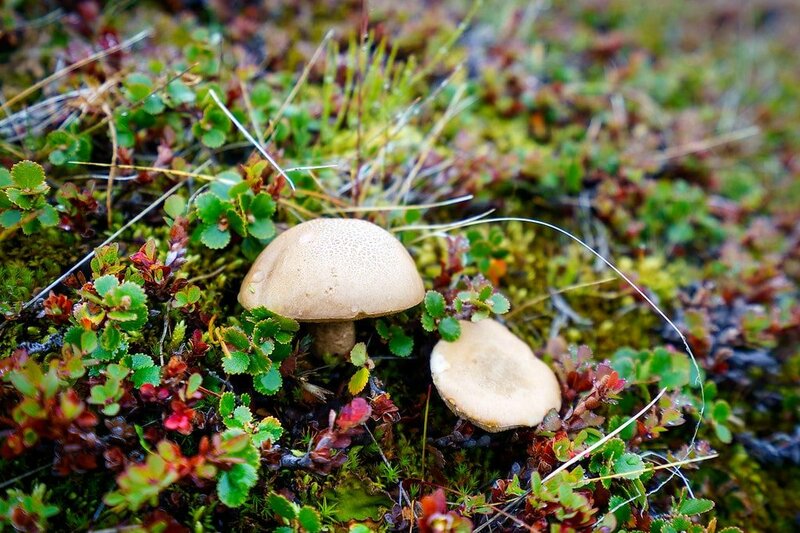 Arctic Circle Trail hikers must be totally self sufficient too. 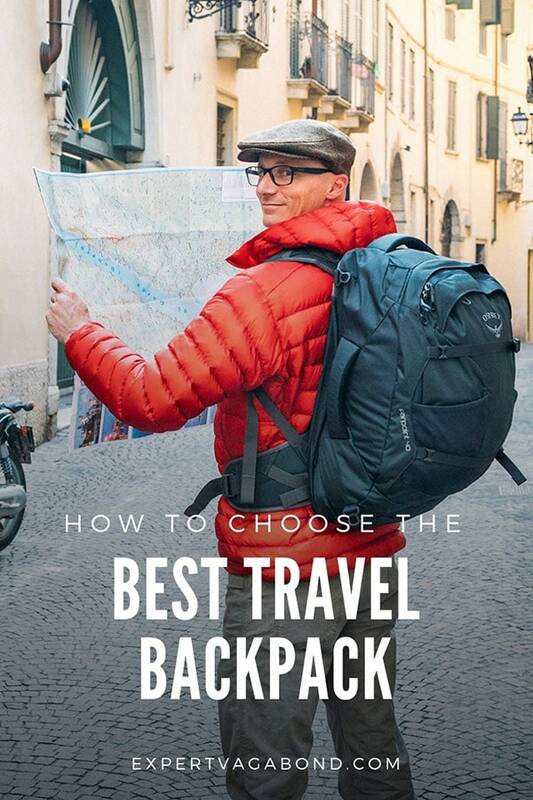 The only towns are located at the beginning and end of the trail, meaning you must pack all your own food & survival gear for the duration of the hike. Outside the towns there’s no cell phone reception either. I was looking forward to this journey for many reasons — testing my survival skills alone in the middle of an arctic wilderness, and enjoying a much needed break from a world of hyper-connectivity. I arrived in Greenland at night after our plane was delayed in Copenhagen. But it was still light out. 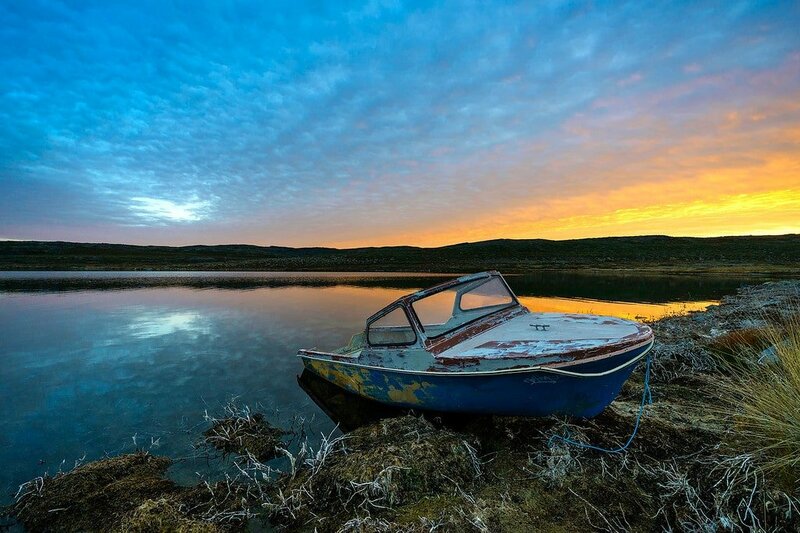 Kangerlussuaq is located North of the Arctic Circle, and the August sun sets around 11pm. 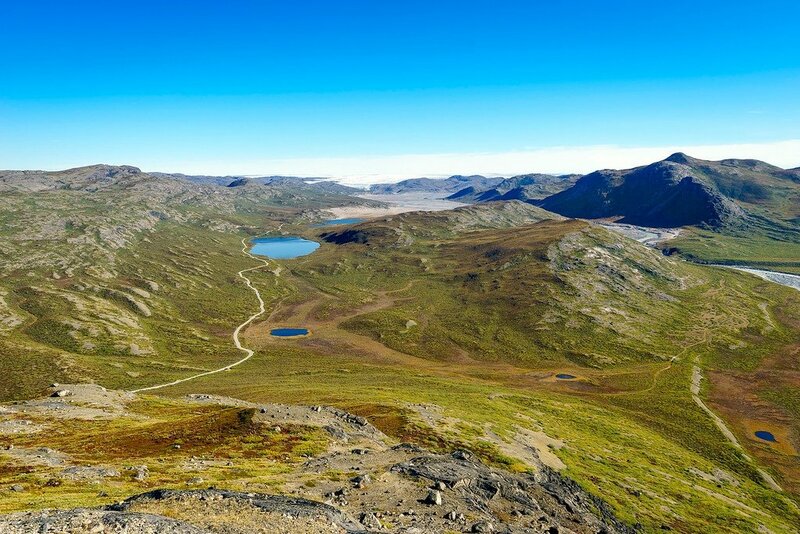 Most hikers start the Arctic Circle Trail directly from Kangerlussuaq, hiring a taxi to the trailhead and walking West towards the coast. However I wanted to begin my hike 40 kilometers East on the edge of the ice cap. So the next day I booked an afternoon tour with World Of Greenland, requesting they leave me at the ice cap and I’d walk back to town on my own. A 4×4 bus drove us along a rough dirt road to “Point 660”, where we spent about an hour walking on the ice. There was no need for crampons or safety ropes here, as the nearby glaciers relieve the pressure that normally causes crevasses. The ice was grippy too, like a layer of crusty snow. 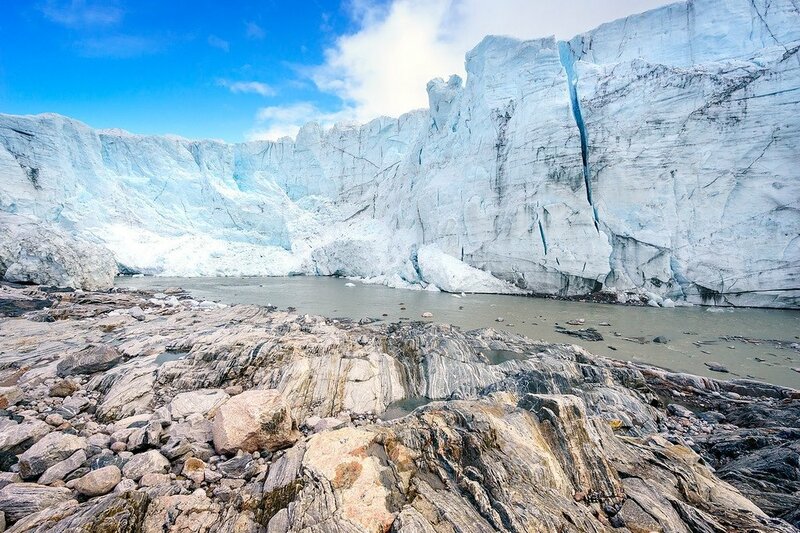 Glaciers are rivers of unstable ice that flow down from an ice cap. 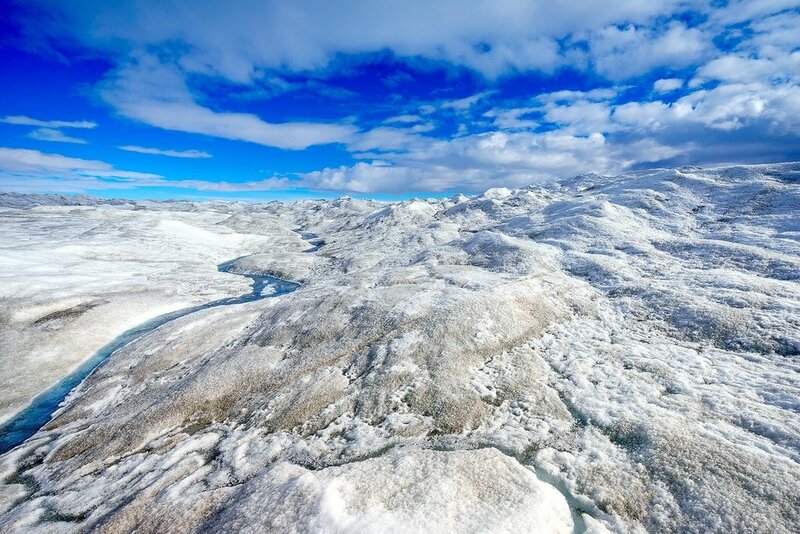 The ice cap itself doesn’t really move — it’s actually very solid and can be miles deep. The tour group eventually left me on my own. I decided to explore Greenland’s ice cap for another few hours. It was spectacular. Rivers of blue meltwater snaked down a landscape of ice that stretched out towards the horizon for as far as your eye could see. 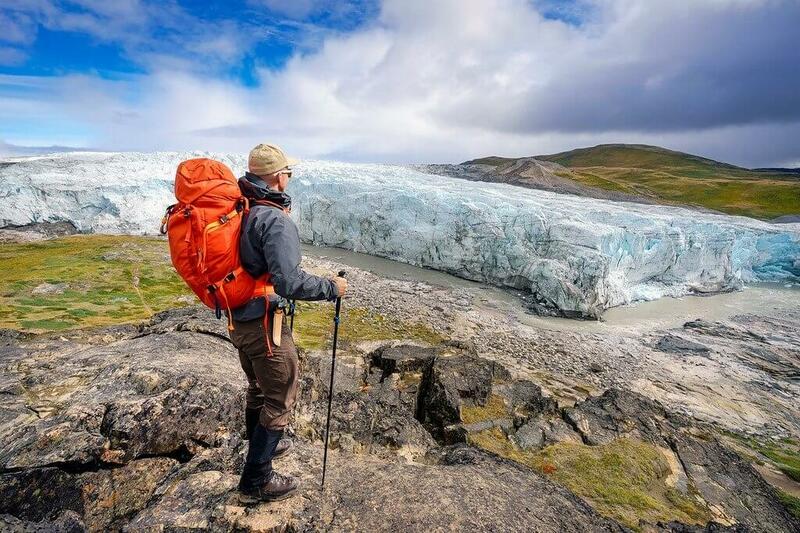 While many people visit glaciers around the world, the opportunity to actually stand on an ice cap is pretty unique. There are very few places where it’s so easily accessible without the use of a helicopter. Dark clouds suddenly rolled in, forcing me to leave the ice and begin hiking down the dirt road back towards Kangerlussuaq. Pretty soon it was snowing! Only 30 minutes earlier the sky was blue… this would be a reoccurring theme in Greenland. The weather changes fast. I saw my first animal dart away into the rocks. 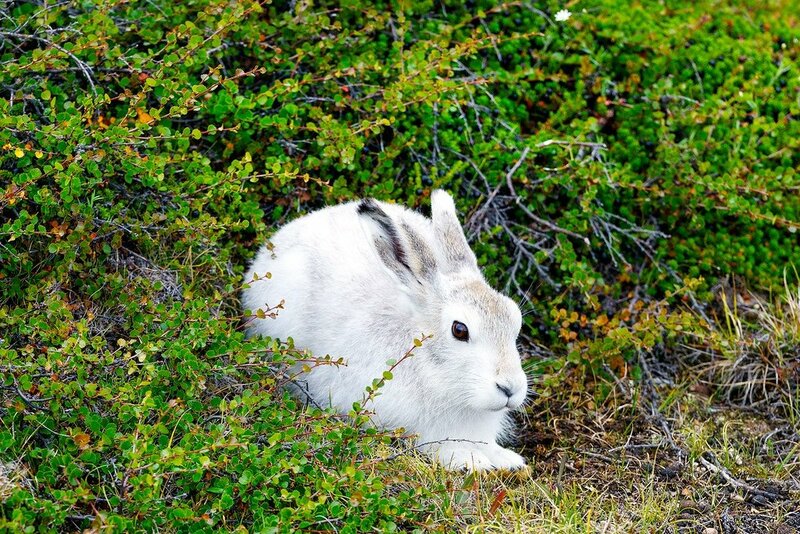 It was an arctic hare, his bright white fur standing out in contrast to the greenish-yellow landscape. Further on, a reindeer bounded across the road. This was the beginning of many wildlife sightings on the hike. The next 5 hours were spent walking on the dirt road, built by Volkswagen many years ago to test their new cars in harsh winter driving conditions. I finally reached Russell Glacier around 11pm and set up camp. CRACK! BOOM! SPLASH! This was the sound of ice breaking away from the 60 meter (180 foot) glacier beside me. The earth trembled as the ice slowly advanced. Russell Glacier is a towering wall of white, blue, and black frozen water covered in jagged cracks. It moves about 25 meters every year, with sunlight and warm summer temperatures helping the ice “calve” into a glacial river. Mountains of moraine flank the glacier’s sides, loose gravel that’s been bulldozed into huge piles over thousands of years by millions of tons of moving ice. You feel very small standing next to it all. The glacier is impressive, and I hung around for hours watching the spectacle of falling ice. Some chunks were as large as a school bus! It’s important to keep your distance from the face of a glacier. Falling ice can easily crush you, pieces can be ejected out over the river, or large waves from the splash could knock you off your feet into the freezing water. Reluctantly leaving the beautiful glacier I continued following the river. 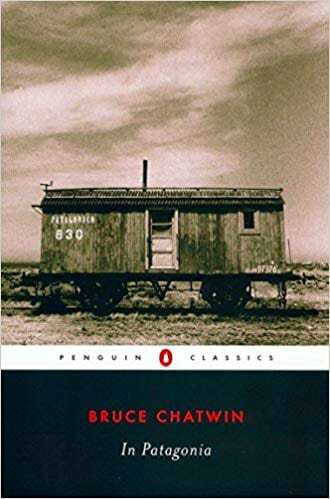 The landscape turned to sand, complete with wind-swept dunes along the banks. It’s an arctic desert called Sandflugtdalen. In the distance, 3 shapes lumbered up the basin towards some mountains. These were musk ox, large buffalo-looking animals native to Greenland. They’re hunted for their tasty meat and warm fur by the local Inuit. Too far away for a photo, but I’d get another chance. Kangerlussuaq used to be an American air base before it was Greenland’s international airport. Next to the road you can find the remains of a Lockheed T-33 Shooting Star that crashed along with 2 others during a blizzard in 1968. Apparently all pilots ejected safely. An arctic fox! What a nice surprise! 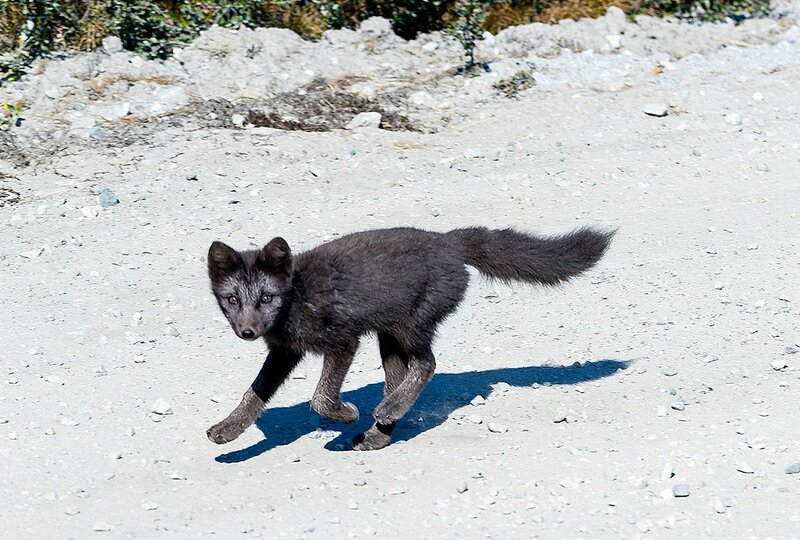 Arctic foxes can be super shy. They’re also pretty small — about the size of a large house cat. There are two varieties, white or “blue” like this one. I crept up as slowly and quietly as I could, but he saw me coming. Like a flash, the fox darted out down the road. Somehow I managed to fire off a few shots with my camera as he passed. 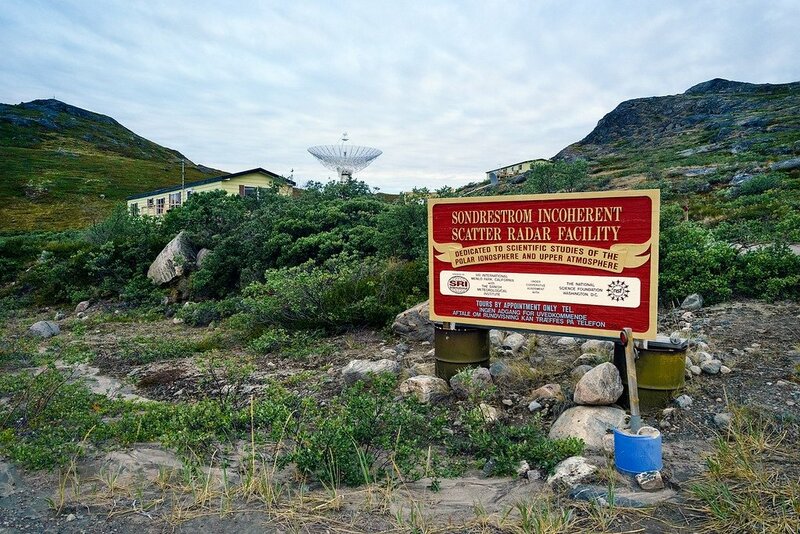 A few miles away from Kangerlussuaq there’s a prominent mountain near the road called Sugarloaf. 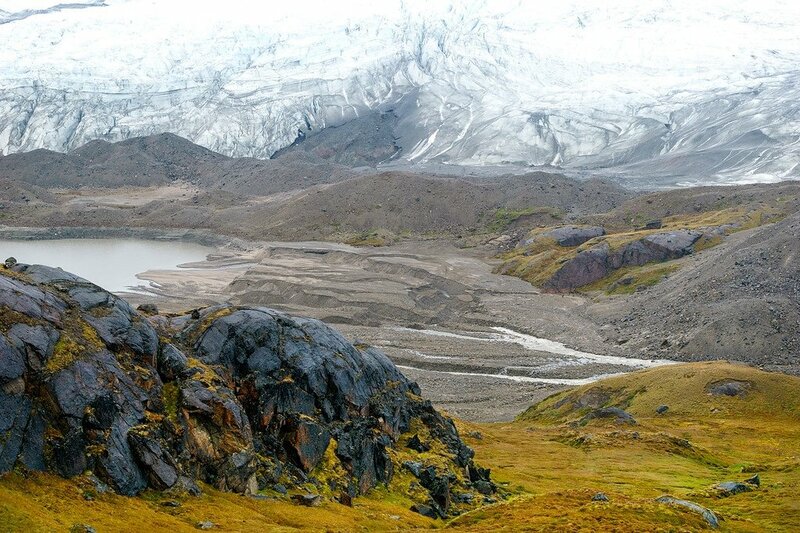 Climbing it rewards you with incredible 360 degree views of the area — Greenland’s ice cap to the East, Kangerlussuaq to the West, and the glacial river called Akuliarusiarsuup Kuua below. At the summit I found a cabin with a few wooden radio towers, part of the old US air base. The hike up looks easy, but it’s actually pretty steep. Just past the mountain are signs warning you not to venture off the road due to possible unexploded ordinance. It seems when the Americans left, they blew up what was left of their ammunition here. However years later some local school kids found a grenade. While a ring of white posts marks the danger zone, the road itself is safe. Arriving back into town after a long day, I decided to pay for a room at the Polar Lodge rather than camp out. I needed to recharge all my camera batteries and iPhone (for GPS), as well as repack. I’d rented a locker at the airport to store most of my food during this first section of the hike. No reason to walk an extra 20 miles with it! I also purchased some dried fish and peanut M&Ms at the local supermarket to supplement what I’d brought with me. In total, I’d have 9 days worth of food packed for the remainder of my Arctic Circle Trail hike. When I first arrived in Kangerlussuaq I mistakenly purchased the wrong gas canister to fuel my backpacking stove. Now I was trying to track down a replacement with no success. The entire town was out. A local guy offered to rent me his stove, which used a different type of gas. But I later learned it couldn’t be refilled at the airport until the “big” 747 airplane left. After wasting hours waiting for it to leave, I finally gave up. So much for hot food & coffee! I’ll hike without a stove. From Kangerlussuaq most hikers choose to hire a $50 taxi to the official trailhead 10 miles away. I stubbornly decided to walk the road, starting late in the afternoon. There’s not much along this road. A tiny local shipping port, some huge diesel storage tanks, and a scientific research station called Kellyville (population 7). They study the Earth’s atmosphere & Northern Lights. 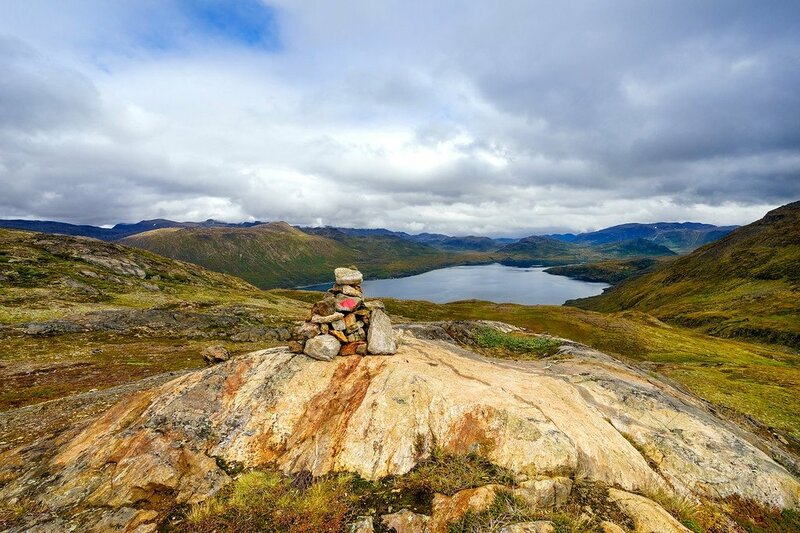 Past Kellyville, a rock cairn painted with a red semi-circle marks the official start of the Arctic Circle Trail. The end of civilization. 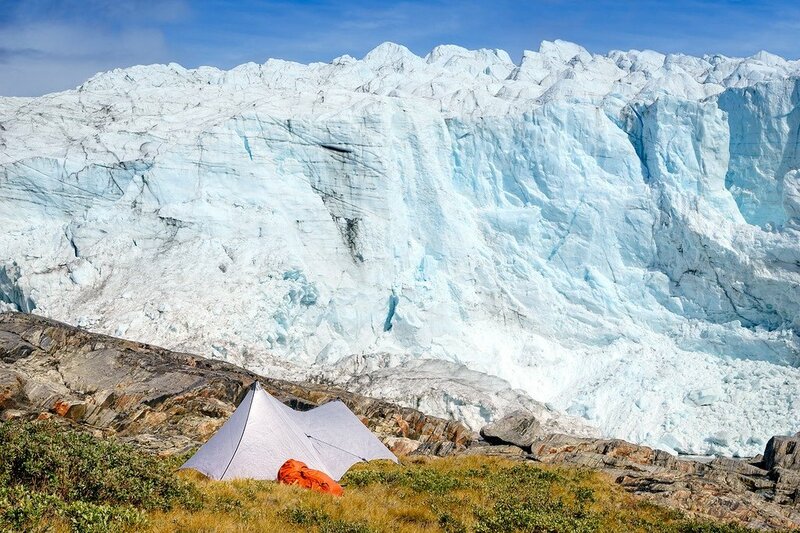 Have you ever thought about traveling to Greenland?